Shipbuilding is one of the oldest industries in the United States, and in the past it was of the largest, most important industries in the land. The US shipbuilding industry was founded with the earliest settlements, built the ships that freed the Colonies, built the merchant and naval fleets that made the US a world power, played pivotal roles in all our major wars, and continues to put the US Navy in a leading position today. 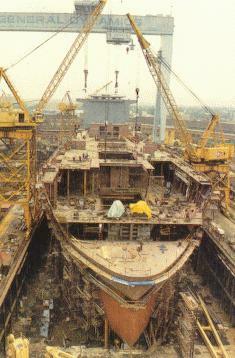 Despite its vast contributions to our nation, shipbuilding is often an overlooked or forgotten industry. In time, these pages will offer a comprehensive overview of US shipbuilding, from the very first organized yards to the "glory days" of the wooden-ship yards, to shipbuilding's finest days during WWII, through the 1990's, when US shipbuilding may be on the rebound. Although the industry has been counted as "down and out" for decades, new yards are now being built, and old yards expanded - the future may be brighter than many had thought. We're just getting started on this section of our site, but we will be adding new material frequently, so check back often! These links are provided for convenience only - listing does not imply endorsement. Canadian Shipbuilding & Engineering, Ltd.
Ishikawajima Harima Heavy Industries, Ltd.